Welcome to our Marie Osmond doll store! 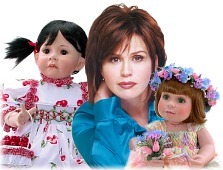 Marie Osmond dolls - celebrating 12 years of quality, beauty and attention to every detail. We offer Marie Osmond collectible dolls - with layaway plan and Free Shipping! Collectible Marie Osmond Dolls The Marie Osmond Doll Collection was born out of Marie's lifelong passion for dolls and doll collecting. She creates dolls that stand the test of time and become heirloom pieces, to be lovingly passed down from generation to generation.